What is the nearest MBTA Station? Park Street Station on the Green & Red Lines. Depart the station and Boston Common is to left of the station kiosk. Where is the Visitor Information Center? The public information center which marks the beginning of the Freedom Trail is located on Tremont Street opposite West Street. What is the cost? Boston Common is a public park and is free to visit. During winter, the Frog Pond is frozen over and ice skating is available for a moderate fee. How long does it take to visit? A walk through Boston Common takes about 5 minutes, but visitors can stroll around or picnic in the park. Is Boston Common safe for pedestrians? During summer, the park is crowded with visitors in the day time, and many people picnic and sunbathe. In winter, there are relatively few people in the park, especially at night. There is a main path from Park Street Station to the Public Garden that attains the most foot traffic. What is the Frog Pond? The Frog Pond is an artificial lake located near the center of the Common. During July and August, the pond is used as a wading pool for young children. In winter, the pond is used as an ice skating rink. What other attractions are in the Common? A playground for young children is located near the Frog Pond. 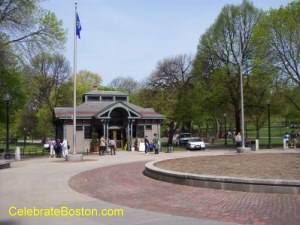 There is a bandstand located off Tremont Street at which events are scheduled occasionally. Also during the year, larger events such as the Walk For Hunger occur at the Common. What are the most historic places in Boston Common? Charles and Beacon Streets is approximately where the British troops departed Boston via boat to Charlestown on their journey to Lexington and Concord (Paul Revere and others made their Midnight Ride warning the countryside that the Regulars were on their way). This area was formerly a mudflat that was filled-in during the early 1800s. At Charles and Boylston Streets, there is a row of brick tombs in the west corner of Central Burying Ground. Under this row of tombs are likely the remains of British soldiers that were buried in a mass grave after the Battle of Bunker Hill. What is the most visited monument on the Common? The Robert Gould Shaw and Mass 54th memorial is located at Park and Beacon Streets. This Augustus St. Gauden's bronze masterpiece commemorates the bravery of the first African-American regiment of the Civil War. What is the strangest fact about the Common? It is likely that the first organized football club in America was organized in Boston and used to play on the field near Charles and Beacon Streets. A tablet is located on the foot path opposite Spruce Street, which overlooks the field. What is the biggest myth about the Common? That Quakers were hanged on the limbs of the Old Elm. Quaker executions most likely took place at Boston Neck, and most pirate executions took place along the waterfront, not at Boston Common. A few criminals were hanged at Boston Common after the American Revolution. A gallows was later erected at the old Charlestown State Prison Street in the 1820s or 1830s as a permanent place for executions. What is the origin of Boston Common? The land was set aside by the free persons of Boston in 1634 for use as grazing land and a training field. The Common was essentially a cow pasture and marsh, fed by run-off from Beacon Hill, for nearly 200 years.